Meredith Foster is Beauty and lifestyle blogger who gained a following for her online makeup tutorials and fashion spreads. She has over 4.9 million subscribers on her self-titled channel and she's also known on her self-titled Vine account. Meredith Foster has always has a skinny frame, but she recently started working out in order to tone up her body. The YouTube star is ripped and while some fans think her health kick is #goals, others are concerned that something deeper is happening. If you scroll through the 21-year-old’s Instagram page, you’ll see TONS of comments that say she’s gotten too skinny lately. Meredith’s weight-loss has also sparked concerns that she is secretly battling an eating disorder. The comments have gotten so overwhelming lately that the YouTuber simply couldn’t ignore them any longer. But even after explaining that she’s “150 percent confident and content with [herself, her] inner being,” fans are still not satisfied. 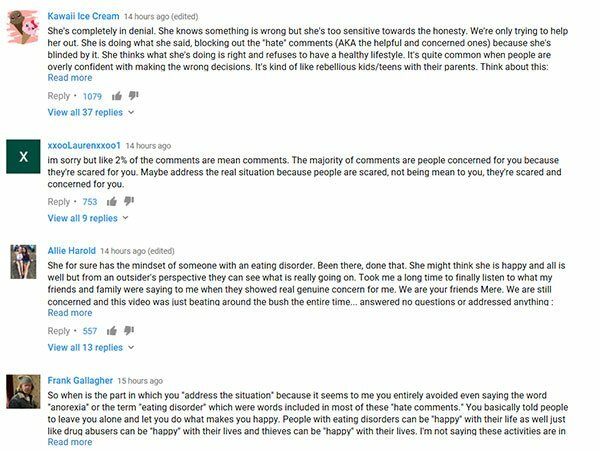 We’re sure Mere thought her video would ease viewers’ minds, it actually did the opposite. Many people are actually now MORE concerned because they say she avoided the topic of having an eating disorder completely. While showing concern for someone is great, it’s important to remember that skinny-shaming is never okay. No one knows Meredith personally, and therefore cannot possibly make such serious accusations. “I’m really worried about u, you look very unhealthy,” one person wrote underneath a picture of her in a bikini.